During the course of your marriage, you and your spouse will experience more conflict than you need to. Many of you will say that you and your spouse simply need "help with communication." We are talking about the same thing since poor communication leads to conflict and unresolved conflict leads to poor communication! Did you know that there are proven ways to communicate better and de-escalate any conflict. Unresolved conflict in your marriage is a huge waste of time and will make it feel as if you and your spouse are suddenly having trouble communicating and getting on the same page. This feels like a huge waste of time because it is! Every couple who has been married a year or more knows the misery of a conflict that has escalated out of control. It started out as something so simple, but before you know it, things went way off track. The next thing you know, each of you is backed into your own corner feeling like you have to protect yourself from any more emotional misery. This is precisely the reason why couples begin to have so much difficulty with their communication. Remember how well you both used to communicate? What happened? You simply drifted off track. Every married couple does and we can help you to get back on track in record time! 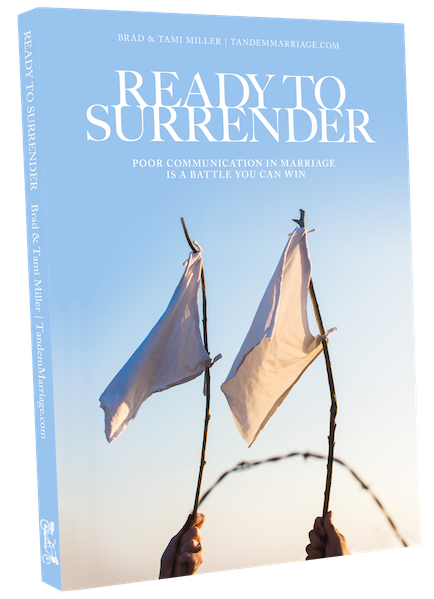 We are Brad and Tami Miller and this is why we wrote Ready to Surrender - Poor Communication in Marriage is a Battle You Can Win. *These are concise chunks of marriage advice. They are what we call "nuggets of relational wisdom." This section gives you many "no-fluff" thoughts about what can make your marriage better today! Ask yourself how much it's worth to recover a wasted hour of your life. How about 2 hours? How about 10 hours or more? We are convinced that our new book will help you to do just that, save years of your life that would otherwise be wasted disagreeing, arguing, and fighting. And this is also time that you would have spent being miserably unhappy. You and your spouse think differently, and that’s ok.
We all assume that everyone else on the planet should think like we do. We are right, after all, right? Actually, no, we are not right. You are not and neither am I. I’m sorry to be the one to tell you that. You do have your very own perspective on life and so does your spouse. Are you ready for a pretty funny story to illustrate this point? Tami and I got married on April 20, 1985. This was well over 30 years ago. Almost one month before we got married, we closed escrow on a 950 square foot home that we bought together. This was a cute little two-bedroom home with a small yard on a corner lot. It was adorable. We even had our very own two-car garage! We could not have been more excited to start our lives together. Even though we chose not to live together until after the wedding, we did enjoy setting up our home together prior to being married. Tami and I would frequently meet at our house after a long day at our jobs to clean things up, hang shelves, dream about home improvement projects, set up our kitchen, and more. It was so fun and felt like all of our dreams for our future together were coming true one home project at a time. One particular night, we were working in our new kitchen. It was a very small kitchen with little counter space and just a few cabinets, so planning out where everything needed to go seemed pretty important. I was lining the cabinets to the right of the stove while Tami was on a step-stool lining some shelves above the kitchen sink. After I finished with the cabinet I was working on, I started to move the few pots and pans we already owned out of the box we had packed them in and into the cabinet I had just lined. Tami looked down at my progress and said, “What are you doing?” I answered plainly, “I’m putting the pots and pans away.” “They don’t go there!” she said. I can only imagine the look on my face in that moment because I was completely baffled. As she came down off of the step-stool, she showed me where the pots and pans should go. Her idea of where they should go (on the left side of the stove) seemed very odd to me and my idea of where they should go seemed very odd to her. So who was right? Of course, I was. And so was she. But in all honestly, neither of us was right. Does this make sense? Nope, not yet. Here is what we discovered. In the house that Tami grew up in, the pots and pans were on the left side of the stove. Therefore, that seemed like the most convenient and obvious location to her. In the house I grew up in, the pots and pans were on the right side of the stove. This arrangement certainly made the most sense to me. After we figured this all out and laughed a bit about it, we realized that this was simply a matter of perspective and preference, not right and wrong. And, we figured out this little jewel of insight before we were even married! The fact that we all have individual perspectives and preferences is a very important thing to remind yourself of. This issue of preference will come up again later in this book and it will certainly come up in your marriage many times. So, our story about setting up our kitchen serves as a very simple example, but the point remains that most of what you and your spouse will argue about will not be matters of right and wrong (or matters of inherent morality), but differences of perspective, preference, and opinion. In fact, research on this subject shows us that more than 90% of what most couples argue about is over matters of personal preference. Once you realize this truth, you will also realize that you don’t have to fight so hard for things that are only a matter of your own preferences. Our individual preferences and opinions make us who we are and add flavor to our lives and our marriages, but are they really worth fighting over? We certainly don’t think so. You can learn to de-escalate conflict and communicate like you did when love was new! This means quicker conflict resolution, better communication, and a happier you. We have added some important extras to insure your success. We dreamt-up and designed what we believe to be the first ever Conflict De-Escatiaon Flow chart. We wanted you to be able to see clearly what it would look like to move a conflict toward resolution instead of away from it. So we combined our own research and time-tested techniques into this drop-dead simple flowchart that will help you take any conflict and settle things down, instead of ramp them up for a change. This flowchart will help you to take the information in our Ready to Surrender book to the next level. Once you read section two in the book, then see it laid out like we have here, you will be blown away. In the same way that compromise (meeting somewhere in the middle) is always a good idea for couples, de-escalating an argument should always be your goal during a conflict. Seek to bring things down a notch or two, not up. Nothing positive is accomplished once your conflict has reached a point of emotional damage, nothing. When you find that your level of communication has hit a new low, the inability to resolve conflict well is most certainly the cause. You could just read all of the steps in the image to the left, write them down, and learn them—and this would work. In fact, this would make us very happy because you would be seeing fewer conflicts in your marriage due to your efforts and ours combined. But most of you would rather download a clean-looking version of our Conflict De-Escation Flowchart without the watermarks. You could have this on your phone for quick reference or on your tablet or computer where you can refer to it again and again. In fact, I keep it on my phone just in case I need to take a time out. Then it's right where I need it! And that is the way we would like you to have it as well. We have taken the time and a keen eye to design this flowchart well. This makes it fun to refer to and easy to learn from. But we are crazy about people having great marriages and we want you to have it. That's why we are including it in the bundle for you. If our book, Ready to Surrender, saves you from just one conflict in your marriage, that alone should be worth it for you. But we know you will get more out of this book than that. Much more! If you purchase this book directly from us and after reading it do not agree that it will save you hours and hours of wasted time in conflict, we will gladly refund your money. All we ask is that you let us know within 60 days of purchase. Email us with your name (the email that was used to purchase) and the price you paid. Use NEWSLETTER50 to get 50% off of your entire order. Just copy the code before clicking on the "Get the book now!" link below. Buy the book from our web store now!